The Roosevelt Dime which enjoys circulation to this day, was originally introduced in 1946 as a tribute to President Franklin D. Roosevelt. 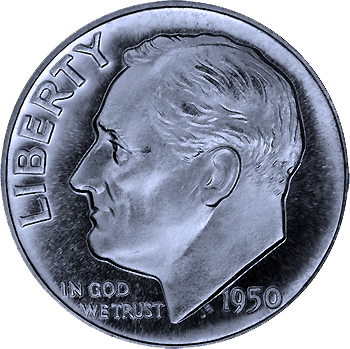 A few weeks after his death in April, 1945, legislation was introduced to replace the current Mercury Dime with a new design. Many U.S. coins had been in circulation since 1916 and 1918 and the time seemed right to introduce new coinage. Not only was this seen as a tribute to Roosevelt’s presidency and his support for the National Foundation for Infantile Paralysis (aka March of Dimes), but it was also seen as a return to “normalcy” for the general public. To adhere to government legislation pertaining to silver content, the Roosevelt dime consisted of 90% silver and 10% copper. Also, to maintain consistency with the two prior dime productions, the weight was set at 2.5 grams and a diameter set at 17.91 millimeters. This held true until 1965 when the metal content of the dime was restructured to contain no precious metals. 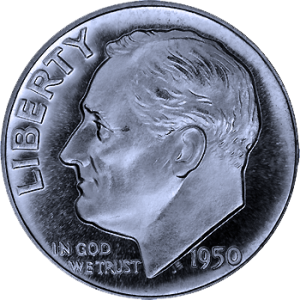 From 1965 until current, the dime has a 100% copper core with a nickel/copper clad containing 75% copper and 25% nickel which gives the current Roosevelt Dime a metal consistency of 91.67% copper and 8.33% nickel. This gives the Roosevelt Dime similar weight (2.26 grams 1965+ vs 2.5 grams <1965) and similar electrical characteristics for vending machines. With such a high volume of dimes produced, very few Roosevelt Dimes have a specific value above and beyond face value. Of course, pre-1965 dimes will have value above and beyond silver spot value and notable exceptions do have extreme collectable value. Most notable among these are the 1968 No S, 1970 No S and 1983 No S. The San Francisco Mint discontinued dime production in 1955 and resumed minting dimes in 1968 for proof sets. The lack of the S mint mark on these has created a rarity situation with the 1968 No S running in the $15,000+ range and the 1970 and 1983 No S proofs running in the $700-$1000 range.